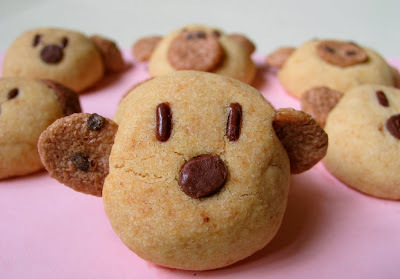 Instead of using Koko Krunch, this time round, we used some Cookie Crisp cereals (the same range of kid's cereals as koko krunch) for the ears. By the way, my younger boy will always check up the cereals shelf whenever we visit the supermarkets. He's not interested in eating the cereals, rather, he just want the little toys that come with the packages. So, I always ended up having different boxes of unopened cereals in my kitchen! My elder boy made this little piggy. 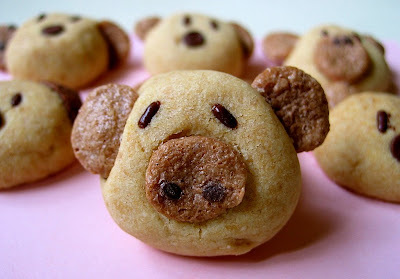 The chocolate chips on the cookie crisps cereals are just perfect for the piggy's nose. 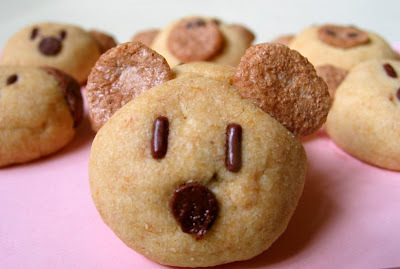 and I made this...it looks more like a bear with the cookie crisps ears. My younger boy's favourite...he likes to make the doggy/bear(or whatever it is) that comes with a pair of flying ears! He calls this his aeroplane doggy. 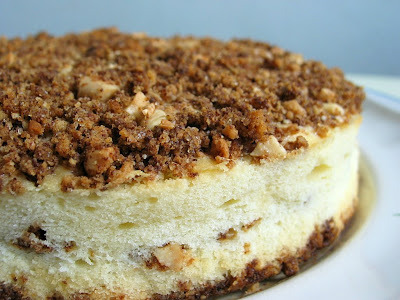 I'm going to make these next week =) Thank you for posting the recipe and lovely photos! I wont be able to find Horlicks, but I'm thinking that milo would be very similar?? Also I think I'm going to have a problem finding ear-like cookies (or cereal)...hmm... But I *love* these so much, I'll do my best to come up with some ideas! 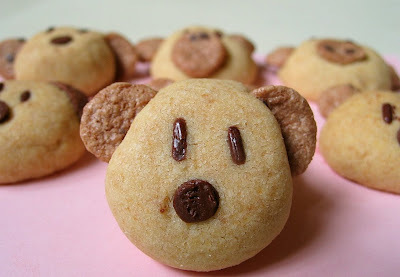 Hi Rei Rei, you can use milo instead of horlicks,I have tried using milo to made these cookies. The cookies are actually very tasty...I prefer those made using horlicks though. Your animal cookies look so adorable. They really put a smile on my face. Will keep the idea in mind for next year's teachers' day. How nice to know you are celebrating teacher's day, we celebrate it here in Oct, 15. 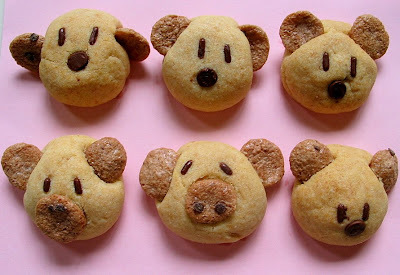 Hi, That pretty had been, I imagine the happiness of all together, preparing these biscuits one funnier than the other:). Until more. Hi Pat, we celebrate Teachers' Day on the 1 Sept here. when i first found your blog, i found the link on flicker when i was doing a search for cookies. and it was your horlick cookies that i saw. those are just absolutely adorable!! i am sad because i don't know where to find the koko crunch or chocolate rice. atleast we have cookie crisp here in california and those look good too. anyway, thank you again for posting all your baking creations! i just love seeing what you'll make next. Aww.. these are so cute!! Actually I've been wanting to make these for a long time but couldn't find koko crunch anywhere. Thanks for a great idea on using cookie crisp!! :)My gal would love these. I am one of your frequent blog readers. Recently I attempted your basic sponge cake recipe as my base for birthday cakes. However, I find that such genoise sponge tends to get very dry and hardens after i put in the fridge. Is this suppose to be like this or have i gone wrong somewhere? Hope to hear from you soon. Happy Baking! Adorable! You and your boys make such cute treats. happy homebaker, can you tell me what chocolate rice is anyway? is it like a chocolate candy shaped in the form of rice? what is it normally used for? there are some asian stores here that i will visit, maybe i'll find them there. Hi maybe strawberry, oh I think it's the term that I used that has caused you the confusion, sorry about it...chocolate rice are actually chocolate sprinkles (see photo on the left of this link: http://en.wikipedia.org/wiki/Sprinkles). I think you should be able to get it easily from supermarket's baking shelves. OOHHHH ok!!!! thank you. i was really bummed out that we didn't have "Chocolate rice" but i am so glad to know they are just sprinkles. i should have known from the pictures what they were. And hor, after baking, the inside of the cookies are still soft... correct or not? Hi Suzie, thanks for visiting :) I saw your cakes from your blog, and I must say they look good!! 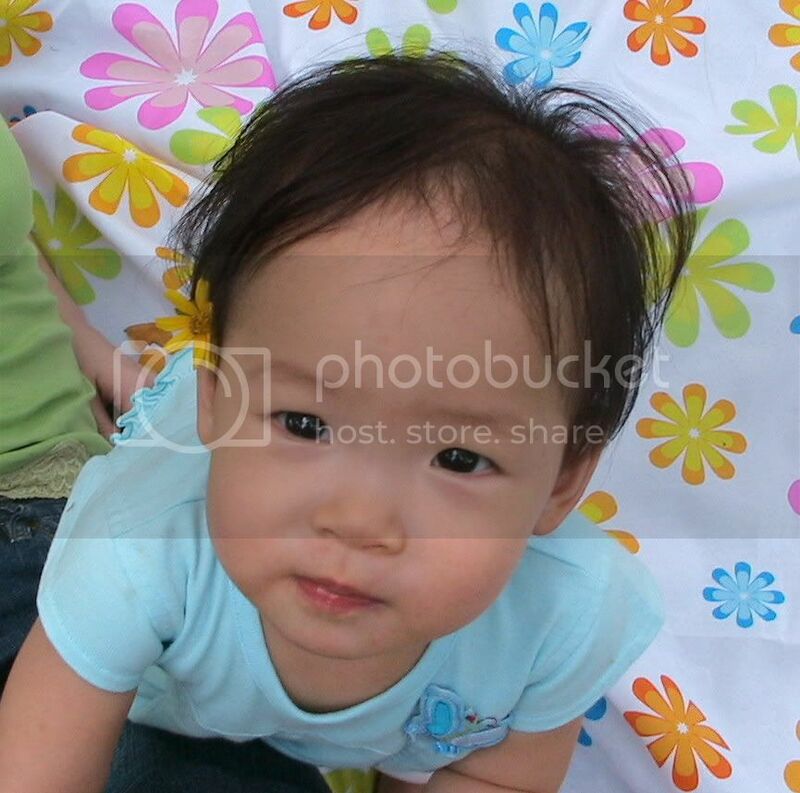 Ning's Mummy, after u add in the flour, you should be able to form a very soft dough by hand. Did you measure the ingredients correctly? The dough is not suppose to be hard at all. Or did you over mix after the flour is added? You will only need to beat it for a very short time, stop the mixer and mix by hand to form a soft dough. You should be able to shape it into small balls easily. After baking, the inside of the cookies should not be soft, they should be dry and crunchy. I believe it was under baked that's why the centre was soft. Let me know if you have any other questions on this. Now i feel so bad for making my friends and hubby and maid eat up my uncooked ones..hehe.. will make up to them with the cooked ones soon. Suzanne, u don't have to feel bad, it's the thoughts that counts. I also feed my kids with sub-standard meals, lolz! 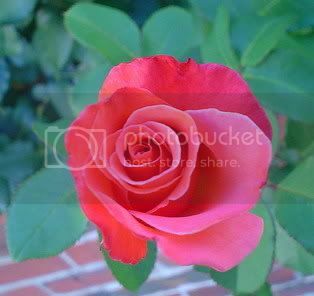 Hi HHB, I have been visiting your blog regularly but have not commented because I'm not much a baker myself, just someone who loves food blogs. I followed your recipe er, not too closely, but cookies turned out delicious and my 2 boys had fun! You are one talented baker, thanks for sharing. I've bought all the ingredients in preparation to try this recipe, but we don't have KoKo crunch here, so I bought some Milo cereal. is that similar to kokocrunch? would it be alright to substitute it for that? the only thing is that the milo cereal is pretty crunchy/hard on its own, so i am a bit concerned that it might turn out even harder after baking? hi ! sorry i dont see the animal cookie recipe, care to share? thanks! Hi luvablekids, please refer to the first sentence of this post, the link for the recipe is under the words "horlicks cookies".